The Adventsingen, a Provo tradition, celebrates 40 years of traditional German, Austrian, and Swiss music meant to open the Christmas season by celebrating the birth of Jesus Christ. PROVO, Utah (December 7, 2014)—When former professors Gerald and Norma Davis organized the first Provo Adventsingen in 1974, they likely had no idea how large the program would one day grow or how much it would one day mean to hundreds who now gather for a night of music and worship. In 1973, the Davises took a group of BYU study abroad students to the world-famous Salzburger Adventsingen in Salzburg, Austria. The annual concert consists of music and spoken word meant to usher in the Christmas season with a focus on the birth of Jesus Christ. Returning to Provo, the Davises brought the tradition with them and organized their very own Adventsingen, reaching out to community members. The concert has featured kinderchors (children’s choirs), studenchors (student choirs), readings from the New Testament in German and traditional German instruments, like the alphorn. This year marks Adventsingen’s 40th performance, presented by BYU’s Department of German and Russian. Though initially small, Adventsingen has become a cherished Provo tradition and draws enormous crowds for its yearly performance. Isaak describes how the Adventsingen acts as an antidote to the commercialism many see in Christmas. 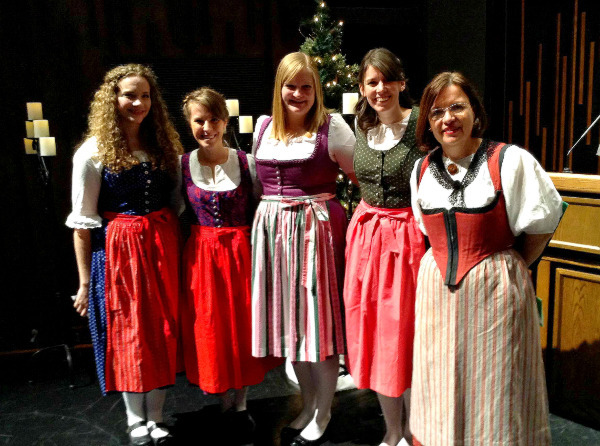 The concert primarily features German language hymns, songs and scripture readings tied to the birth of Christ. Even the traditional folk songs showcase a gentler and less frantic side of the holiday. “The Adventsingen’s focuses on the true meaning of Christmas. It’s a wonderful way to start the season,” Isaak said. For years, the Adventsingen was hosted in the Provo Tabernacle. When the building caught fire in 2010, organizers feared that they wouldn’t be able to continue the tradition. Fortunately, Adventsingen fans in the dean’s office of the College of Humanities worked hard to secure the de Jong Concert Hall on BYU’s campus for the performance. At the end of the performance, the Davises were called to the stage and thanked for starting the tradition that has come to touch so many lives. Together, the performers and audience joined to sing “Stille Nacht” (“Silent Night”) to close the concert, a tradition that will continue for years to come.